During our recent trip to Japan, we spotted this bottled tea in a Tokyo convenience store. 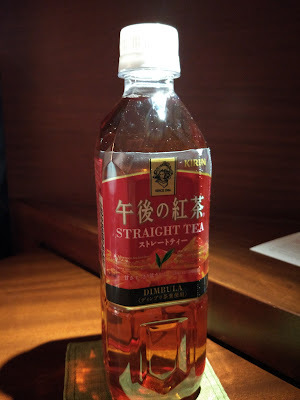 What got me intrigued about this particular tea is that it was described as "straight tea." I had no idea what that meant so i figured why not find out what does straight tea taste like. This 500 ml bottled tea from Kirin, is described as "newly blended fresh cut tea leaves, evolved to authentic iced tea with a more fragrant taste of aroma taste of tea leaves". It continues describing it saying that "Dimbra authentic ice straight tea relaxes with a gentle aroma of tea leaves and a refreshing aftertaste." So what did it taste like? Although there are sugar ingredients (fructose corn sugar liquid, sugar), there isn't a hint of sweetness. Despite that, it didn't taste bitter either. The aromatic aftertaste of this black tea based drink desires more that I enjoyed it with small sips instead of gulping it down like a quench thirsting beverage. So where's the "straight" part in this? I guess it's more of a straightforward tea offering. No fancy or complex combinations of ingredients were needed to make this drink favorable. I'm looking forward to trying this again if I can find this in a Japanese supermarket.